The last few weeks have been a bit crazy! I've gone into designer mode. I submitted my monster rattle pattern to the Knit Picks Independent Designer Program and it has been accepted! I just sent my bio and a picture and it will hopefully be up on their website within the next couple of weeks. I am also in the process of having another pattern test knitted. This is the first time I've done this and it has been a wonderful experience. All of my test knitters are so nice and their feedback is really helpful. 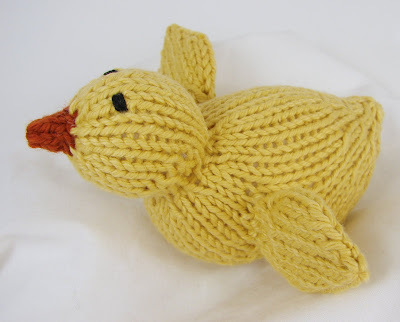 With a few small changes, I hope to have my pattern for knitted chicks up in the next week or so. They are lovely and perfect for spring. 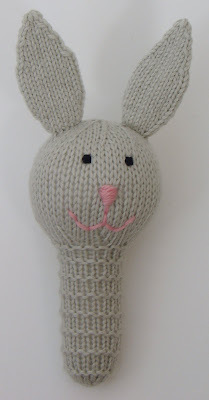 Another pattern that I'm working on is for a bunny rattle. It is a variation of my monster rattle pattern. Is simple, quick to knit, and also great for spring. As soon as I knit a few more samples and type it up, this pattern will also be appearing on my ravelry page. I'm really loving pattern designing. More coming soon!